Impossible Dream issues forth from a world beyond the present and into a realm where intimations of mortality and the after death are communicated through pure instrumental sounds. As the rigid confines of convenient earthly perceptions vanish, so too, the musical boundaries extend. When that commonly known tonality is disrupted, one senses a new emotional code in which time is suspended. Eyes closed, an uninhibited mind will find here an amazing virtual reality. Describing the disc’s main piece, Peter Ware’s string octet, Kabah, Joseph McLellan of the Washington Post writes: "An exotically evocative piece . . . with eerie harmonics, long held notes and often sparse harmonies conveying a sense of vast emptiness and antiquity." 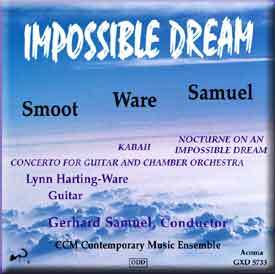 Featuring the CCM Contemporary Music Ensemble, conducted by Gerhard Samuel, this recording opens with Samuel’s Nocturne on an Impossible Dream for mixed chamber ensemble and also includes Richard Smoot’s Concerto for Guitar and Chamber Orchestra. "Her light, almost hypnotic touch of the strings and her highly musical interpretation prove each one of her recordings as new points of reference for guitar performance." "(Kabah) An exotically evocative piece, describing the atmosphere and spirit of the place with eerie harmonics, long-held notes and often sparse harmonies conveying a sense of vast emptiness and antiquity." "The music is all engaging, the playing is excellent and the whole album (Impossible Dream) is a most worthy effort." "Peter Ware's ‘Kabah’ begins with a haunting, almost eerie prestissimo appassionato accented by sweeping strings and a bed of low notes under a single hanging violin line, creating a sense of awe and mystery. In the andante con mosso, low note clusters are again used to create that sense of weight, the weight of years. Maybe it's just the unsettling nature of the arrangement that makes presto con brio convey such a sinister feel."